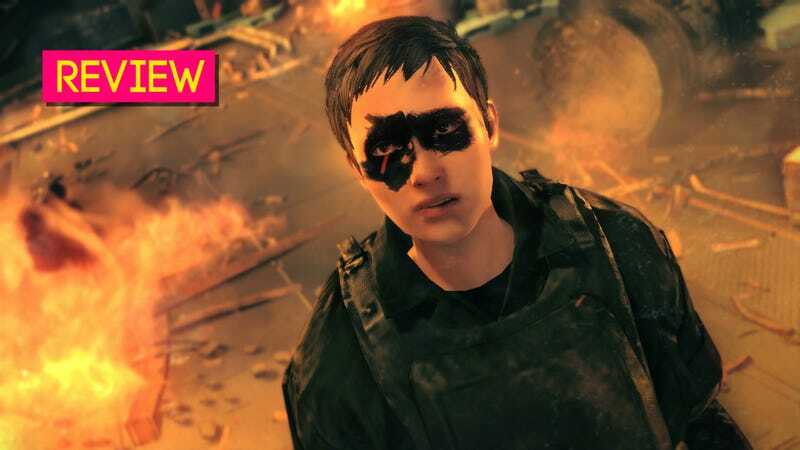 Metal Gear Survive is wreckage of the long battle between the series’ lead creator, Hideo Kojima, and Konami, his long-time employer who ditched him three years ago. Kojima split with Konami after a lifetime of making Metal Gear games, going back to the first in 1987. Survive is Konami’s attempt to make a new one without him. It’s a bad game that’s more fascinating than I expected. Trapped within the Kojima-Konami conflict were numerous programmers, artists, and designers left behind. In the end, they made a game about trying to survive disaster. It is captivating in implication and occasionally clever in execution. Metal Gear Survive starts at the end of Metal Gear Solid V: Ground Zeroes. After an attack destroys the home base of Big Boss’ mercenary empire, the survivors of the attack are swallowed by a massive wormhole that drops them into a dusty wasteland swarming with nanotechnological zombies hell bent on killing every last human being on the planet. You control a customizable soldier from Big Boss’ army thrust into that ruined world. You must gather survivors, craft weapons and armor, and survive long enough to find a way back home. Let’s not beat around the bush: Metal Gear Survive is the story of a loyal soldier left behind by their boss and tossed into a hellscape of reused Phantom Pain assets where they must build some type of meaningful existence out of the accumulated debris. The bizarre dimension is called Dite, referring to the massive city that encompassed the last four circles of Hell in Dante Alighieri’s The Divine Comedy. The player’s chief radio support team member is an artificial intelligence called Virgil. Your hero of this story is trapped in what might literally be Hell itself, where familiar settings from Metal Gear Solid V crop out of the dust as a reminder of what was and what will never be again. "Why are we still here? Just to suffer?" Finished the campaign in about 15 hours. Played roughly 12 more in multiplayer. Other Metal Gear games were about the dangers of digital information, the tragedy of being an action hero, and the nature of loyalty and patriotism. This one is about thankless labor. The single player mode is a tiresome series of missions to gather survivors and build a home base that can withstand an endless zombie horde. The player ventures out, gathers supplies, and builds a makeshift fort while also searching for food and water. Every moment of Metal Gear Survive is a struggle to merely exist. This struggle is miserable and mistakes are calamitous. If you die, you are dropped back at your base before the start of your current mission. Once, in Survive, I fought in a 16-minute wave defense near the end of the game and died with about four seconds remaining. I needed to embark on a long journey across the game world and start that lengthy defense over again. That’s excessive even by standards of the genre. Even with supposedly difficult games like Dark Souls, you’re not more than a few minutes from either your goal or another bonfire. Metal Gear Survive punishes failure by making you spend more time with Metal Gear Survive. There are brief moments when the game works well. There are moments when it feels like a worthwhile, interesting struggle to survive in a strange and hostile world. You’ll break a gun, embarking on a dangerous mission to find loose screws to repair it and gunpowder to craft more bullets. You’ll eagerly wait for a potato harvest on your makeshift farm and lament when it yields two measly crops. You’ll slink through a derelict oil rig, the inside lit with iridescent crystal formations, and you’ll sneak past a hive of nano-spiders to recover antibiotics. These moments come and go in flashes, but will likely inspire more anger than wonder when you’re dumped back into a boring hike through the rest of Survive’s drab and forgettable world. Multiplayer matches bring the action into focus for brief periods. In them, a small team of players must defend a location against three waves of increasingly difficult enemies. They can craft weapons and defenses to drive off the throng of zombies. Ramshackle wooden barricades and wobbly fences buckle against the horde. Each round demands quick thinking and tactical planning. At higher levels, bases turn into a Home Alone maze of automatic turrets, flame traps, and mortar emplacements that reduce enemies to dust. Watching zombies slam into barricades and stumble into trip mines is consistently mesmerizing. Like water and food, satisfying gameplay is scarce in Survive. The bit of it that is there is undercut by a progression system that makes hours of playing a grind. Players accumulate tons of resources to build better gear and weapons in a core loop that may bump a defense statistic or craft a more powerful shotgun. The player is stuck in a gameplay purgatory where they tread water for meager rewards, slowly leveling up to work through a character upgrade tree that offers few benefits. While the tree does offer useful special attacks, such as a powerful thrust attack for spears, players will mostly dump points into stat upgrades that never seem to make things easier. Playing Metal Gear Survive feels like work, an act of labor the player performs day after day in the hope of getting new things and maybe achieving some sense of comfort and satisfaction. It never comes. No matter how many defenses you build, no matter how many rifles you assemble, there’s never a sense that anything you’ve built matters. It feels like building Legos in the desert. What’s the point? Far Cry 2 and Splinter Cell designer Clint Hocking explored this moment in a 2011 GDC talk called Dynamics: The State of the Art. He focused on the concept of ‘dynamics’ as defined a 2004 Northwestern University research paper by Robin Hunicke, Marc LeBlanc, and Robert Zubek that defines dynamics as “the run-time behavior of the mechanics acting on player inputs and each others’ outputs over time.” Hocking explains that the exertion of mechanics on the player can generate thematically resonant gameplay moments that tie into a game’s larger message. With the right combination of dynamics, gameplay can impart meaningful messages to the player. Far Cry 2 is a game about the futility and brutality of war. Abraham’s experience is dynamic, as a combination of systems such as fire-spreading and enemy animations simulating severe injury created a moment where he empathized with his enemy and felt, in grave detail, the utter nihilism and dread that combat generates. Through gameplay and mechanics, he found the message of Far Cry 2. Metal Gear Survive is a game filled with dynamic moments, but the corresponding message they convey is disheartening. I experienced this in a moment of revelation during a rescue mission. Responding to a distress signal, I snuck past a handful of wandering zombies to recover a fallen soldier. To return him to base, I needed to cross a hillside teeming with enemies and reach an outpost where I could activate a teleporter. Sneaking into the small outpost, I disposed of some zombies in the courtyard and hid the fallen soldier in a shack that I barricaded with a chain link fence. When I activated the teleporter, every nearby zombie—a horde numbering at least 35 raging monsters—descended on my position. I tried to fend them off, but they eventually broke through. I climbed on top of a large box and stabbed one of them to death with a spear. Then I stabbed another. And another. One by one, I stabbed until they were all dead. By the end of it, my weapon was broken. A heap of corpses rested at my feet. I jumped off the box and began to harvest resources from every single corpse. I used my knife to carve each zombie. This took several minutes. It was madness. By the end, I had acquired a heap of energy for leveling up my character and crafting resources. Satisfied, I entered the portal and returned to base. There was one problem: I had forgotten to bring the helpless distressee back with me. Metal Gear Survive is a game where you set out with any number of purposes—save lost soldiers, hunt for food, investigate energy anomalies—and lose all sense of your goals as you are side-tracked by the never ending spiral of killing and consuming everything around you. As bodies mount and resources pile, any semblance of purposeful play fades away until you, like the zombies you intend to battle, wander forever in a perpetual process of acquisition and consumption. It is mindless. In that moment on that box, the game impressed that mindlessness on me with such clarity that I felt disgusted. I had found the message of Metal Gear Survive: nothing matters. Metal Gear Survive comes off as a cry for help. Its team is comprised of series veterans as well as key artists and designers from other abandoned Konami franchises. The game’s distinctive zombies were created by Silent Hill creature designer Masahiro Ito, famed for his design of the iconic Pyramid Head. Ito’s designs feel wasted in Metal Gear Survive. Producer Yuji Korekado has worked on the series since Metal Gear Solid and pushed back against Kojima during the production of Metal Gear Solid 4: Guns of the Patriots. An easter egg in the game seemingly refers to him as “Cunning Yuji.” Metal Gear Survive feels fractured, a product of disparate minds forced to cobble together a Metal Gear game that will capture players in an unceasing spiral of grinding and toil. It is a torture device that not even Hieronymus Bosch could have conceived of. As angry as this game may make Metal Gear fans, the game itself seems even angrier. This is illustrated by how Survive uses a key piece of series iconography: the Metal Gear. Throughout the series, Metal Gear units fulfill a variety of narrative and thematic functions. Metal Gear Solid, the third game in the series, introduced Metal Gear REX, a walking battle tank that used a railgun to launch undetectable nukes. Much as the move to PlayStation marked the series’ transition into the “solid” realm of 3D, REX marked a paradigm shift within Metal Gear’s world fiction where weapons and technology supplant flesh and blood soldiers. Metal Gear Solid 2’s Metal Gear RAY was designed to destroying derivative Metal Gear units based on Metal Gear REX. That game was all about deconstructing Metal Gear Solid, and RAY was a manifestation of that destructive, subversive impulse. Metal Gear units are always more than just giant mechs—they are symbols intimately tied to each game’s thematic goals. 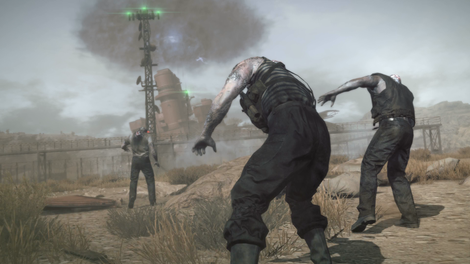 In Metal Gear Survive, the only Metal Gear the player encounters is the ruined corpse of Metal Gear Solid V: The Phantom Pain’s Metal Gear Sahelanthropus. The flagship mech of Kojima’s final directorial hurrah is broken and gathering dust. It is the job of the player, the job of one of the remaining Mother Base soldiers, to revive Sahelanthropus for a climactic battle against the Lord of Dust, the massive nano-tech giant controlling the game’s zombies. Through reviving one of the last remnants of Kojima’s final stand, loyal players annihilate an icon of mindless consumption hell bent on ruining the Metal Gear universe. Survive’s endgame has been devoted to preventing the Lord of Dust from carrying out a perpetual cycle that destroys everything the player has ever known. When the player takes aim using Sahelanthropus’ restored rail cannon, the Lord of Dust’s weak point might as well be a glowing Konami logo. Metal Gear Survive’s team managed to make a game both bad to play and fascinating to examine. Survive finds itself in small moments but is lost to grinding, mindless gameplay. The point of Metal Gear Survive is that there is no point; there is nothing that cannot be broken down for the grossest material consumption. You might find some insights poking around the wreckage, but at the end of the day it’s still a pile of junk.